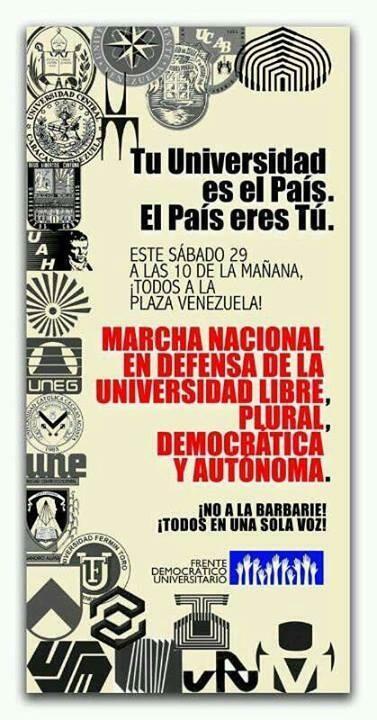 Today Caracas will see opposing marches by university students and faculty. One march will be in support of the indefinite strike called by faculty from the “autonomous” universities. The other will be in support of the government’s efforts to expand access to higher education. After several rounds of meetings with pro-government unions of professors and university workers, Minister of Universities, on June 14 Pedro Calzadilla announced that an agreement had been reached that will include both workers and professors in a single common contract and include average pay raises of 130% for all public universities personnel. However, faculty of the biggest independent professors union Federación de Asociaciones de Profesores de Venezuela (FAPUV) have declared that the indefinite strike which began on May 30th will continue. In this post we explain why the crisis has not abated even after the announcement of seemingly significant salary raises. The problem lies in the nature of the rapid expansion of the university system in the past 14 years and in the government’s strategy of creating parallel institutions. Free higher education was guaranteed under the 1961 Constitution. And indeed in the ensuing decades the government expanded existing institutions (Universidad Central de Venezuela (UCV), Universidad de los Andes (ULA), Universidad de Zulia (LUZ)), and created new public universities (Universidad del Oriente (UDO), Universidad Simón Bolívar (USB)). But the deterioration of the primary and secondary education system at the same time led to a situation in which admission to these public universities became highly regressive. Low quality public schooling meant that a high percentage of those who benefited from free higher education were middle class and wealthy students from private high schools. Public universities reached high academic and research standards during the 70’s and 80’s relative to the region, but often seemed distant from the situation and needs of the rest of the country. Furthermore, demand for university education expanded much faster than the system, meaning many young people who wanted to, could not attend. The 1999 Constitution reaffirmed the right of free higher education for all. The Chávez government made serious attempts to comply with this obligation and to expand what it regarded as an elitist system. But since existing public universities have far reaching administrative and academic autonomy, and were reticent to rapid expansion plans, they moved at their own pace. This same autonomy has meant that the autonomous universities are the one part of the public sector that the Chávez government was not able to gain control over. Indeed Venezuela’s autonomous universities are still the most important source of informed criticism of the government. With its plans impeded by the autonomy of existing universities, the government has progressively developed a parallel system of higher education that it could more closely control, both economically and ideologically. The government created several new national universities (such as the Universidad Bolivariana de Venezuela UBV, and the Universidad de Nacional Experimental de las Fuerzas Armadas UNEFA), or joined existing institutions into new national universities (such as the Universidad Nacional Experimental de las Artes UNEARTE, a fusion of existing music and arts schools across the country). A total of 29 new higher learning insitutions have been created since 2000. Most of these new institutions incorporate in their statute an “experimental” character, which means they enjoy only limited autonomy: their authorities are not directly elected by the university community but directly appointed by the government. The Venezuelan government says this expansion has increased the number of university students by 170% since 1999 and increased the budget by 800% (calculated in official rate dollars. At the parallel rate it would be closer to 200-300%). But critics claim that these new universities lack minimum academic standards and are only universidades de carton (cardboard universities). Of course the increase is not only in the number of university students but also of faculty size (even if in most of the new universities teaching is done by temporary adjuncts on an hourly basis). Because professor’s salaries are equal by law, according to rank across the public university system, this expansion of faculty size means that it is almost impossible to raise faculty and staff salaries without straining the education budget. A stagnation of salaries has ensued in which a full time Profesor Titular (highest faculty rank), even after a previous rise of 40% announced in September 2011, earned an average monthly salary of around Bs. 5,000 (less than 900$ at the current official exchange rate. Less than $200 at the current parallel rate). The salary of an Instructor was close to minimum wage. In February this year faculty began protesting their low wages with a series of one day strikes which eventually led to the indefinite strike ongoing since May (a timetable of the protests can be read here). The government began a round of negotiations in February, but again relying on its institutions paralleling strategy, announced it would talk to the pro-government union which includes both professors and university workers in a single organization, Fetrauve (Federación de Trabajadores Universitarios de Venezuela). FAPUV was invited to the negotiations, but refused to attend upon learning that it would be only one of the negotiating actors together with the government backed union and that single negotiations would be conducted with professors, administrative personnel, and workers lumped together. Striking professors have been recurrently accused in state media of denying students their constitutional right to education, of being coopted by the “right,” and of having an “electoral/political” agenda. First, even if the salary increase announced seems significant in nominal terms (a Titular will now earn 10,645Bs. ), the increment will only be progressively paid in parts: a 25% increase retroactive from January 2013, a 25% increase starting September 2014, and a 25% increase to take effect in January 2014. Faculty and workers fear that high inflation will eat up most of their raises by January 2014. Second, and more importantly, university workers and professors feel that the way the government refused to even acknowledge its legitimately elected unions, and instead negotiated with a parallel pro-government union, will seriously break faculty and workers negotiation power in the future. The agreement on a single proposal was reached by government appointed union leaders and not by elected representatives of workers, administrative employees, and professors. A third issue source of faculty discontent is that the collective contract includes both professors and university workers. The government claims this makes the agreement different form previous negotiations and, in words of Minister Calzadilla “truly fair:” “For the first time in Venezuela’s history, workers, administrative employees, and professors, reached an agreement and made a single proposal, and this is an accomplishment.” From the faculty perspective a unified agreement threatens their negotiating power vis-à-vis the stronger university administrative and workers personnel unions.